The European Masters tournament is the pinnacle of regional and grassroots League of Legends esports and is the leading event for semi-professional players in the region, pitting country against country and team against team, coming to a close with the live finals. 26 teams competed for a prize pool of EUR 150,000 with matches broadcasted live in ten languages. We speak to Sam Deans, ESL’s executive producer about the event and how he designed a workflow that would handle a huge amount of video signals, but ensure the gaming experience was translated effectively to those watching on big screens as well as via livestreams at home. What are the main challenges that esports production brings? There’s a paradox in egaming: teams are constantly having to rewrite the rules for content production, because we’re doing so many new things, but at the same time production teams can often struggle to afford off the shelf, high cost production systems for areas of their workflow. The League of Legends is a great example, as for VT playout, instant/slow motion replay, on air fill & key motion graphics and for driving dynamic scenic LED screens on stage, we needed to build and specify our own bespoke systems. When I started to design the architecture for such a complex production, I knew that Blackmagic Design kit would be at its heart, both from a technical and financial perspective. This was a huge event in terms of staging - tell us where you started with your planning? 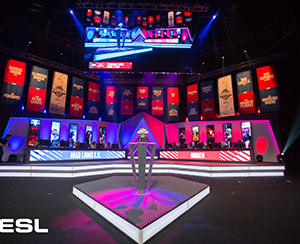 The event marked ESL’s biggest ever volume of video signal routing and distribution, combined with having to work in a large theatre-style venue. We started with the routing infrastructure and built out the design from there. Every video source throughout the venue was handled by a pair of Smart Videohub 40x40, from the robotic cameras covering the stage, to the four gameplay feeds generated by high spec gaming computers. We maxed out the Videohubs’ outputs, which delivered 1080p59.94 feeds through to audience viewing screens, green rooms, commentary desks and ESL UK’s flyaway production gallery, which had been specifically designed for the finals’ livestream. So, alongside the routers, we relied on a massive quantity of Blackmagic Micro Converter SDI-HDMI, to allow us to feed the various screens across the theatre. Tell us more about those systems and how you designed them? Blackmagic Design Decklink PCI cards were the defining factor of the custom built PC systems that we built inhouse. They allowed ESL’s own, and 3rd party broadcast software to input and output video natively over SDI. We used Decklink Quad 2 cards here primarily, because of their ability to output, or input, up to eight total video signals from a single card. For gaming events, this is a hugely powerful feature. Our instant replay server ingested four live video feeds, and outputted one output back to the vision mixer, all in 1080p 59.94 fps, all on a single Blackmagic Design Decklink Quad 2 PCI card. On stage at the League of Legends we had a series of tall, dynamic LED screens behind each of the players and these would reflect the in-game characters that players picked out - and there was more than 140 options for the players to choose from! The media was outputted via DeckLink Quad 2 cards with our custom hardware solution, and produced a high quality and relevant backdrop to the players. With any gaming event, you have a lot of sources to handle. How did you design the program mix to showcase everything that was going on? The live production system was built around two ATEM 2 M/E Production Studio 4K switchers, working in tandem, which allowed us to segment the various production streams. The primary switcher was responsible for the master PGM mix, and received camera signals, broadcast graphics, video playback and video game signals. This switcher was controlled with an ATEM 2 M/E Broadcast Panel, which worked brilliantly. Having the panel in front of you when you’re dealing with more than 18 sources brings a real confidence to the mix. The switcher’s internal media store also complemented our graphics server, because of the recall speed, which was vital for such a fast paced and constantly changing program mix. Then second ATEM switcher was used to create a submix of ten POV micro chip cameras placed in front of each player. This shot is a staple of esports production, and is critical in translating the players&rsquo; emotions through to the audience. We managed this mix with an ATEM 1 M/E Advanced Panel, which gave us a compact, but powerful control surface to mix the appropriate camera signal to air. That must have made for a very busy screen layout - how did you keep the production design clean and informative? When we combined the two mixes, it did produce a complex screen layout, so we relied heavily on features such as SuperSource and stingers as well as clean and timely transitions to make sure that the audience could follow all the action, but not get confused by the sheer amount of content we were throwing at them. A typical SuperSource layout would have four boxes of repositioned gameplay, and then we’d add a DVE box in the middle for the POV camera of the player, while they select their champion during the ‘pick and ban’ or ‘draft’, the initial phase of the game right before the action commences. We then inserted Fill and Key graphics over the top of everything using the second Upstream Luma Keyer. What does the future hold for ESL and its live productions? I’m sure future events will become even more sophisticated and challenging in terms of technical and editorial production, given the speed at which the industry continues to develop. However that manifests itself, Blackmagic Design’s kit will definitely play a key role in our production workflows. Each new product or update addresses specific, real life challenges that we face in our productions, and this allows us to bring ever more exciting productions to fans across the globe, whilst maintaining the ultra high end broadcast quality that gamers expect from their streams.